Between May 22 and June 5, Causa Artium – an institution that, according to its website “works to create new opportunities and venues for poets, painters, musicians, writers, and other artists of all kinds” – hosted New York’s first annual Festival of Russian Arts. Focusing on a general theme of “literature”, the festival, in conjunction with the New York Public Library and Russia’s Debut Prize Foundation, offered a series of panels and screenings that all sought to explore the multiplicity of viewpoints that make up Russian literature. The idea of approaching Russian literature from multiple points of view found its most interesting iteration in the film portion of the festival. All of the works presented were adaptations of Russian classics, both by Russian and foreign directors. Foregoing David Lean’s Doctor Zhivago and other such well-known classics, organizer John Narins opted for overlooked gems from a range of countries, many receiving their first English translation and first public screening in the U.S. 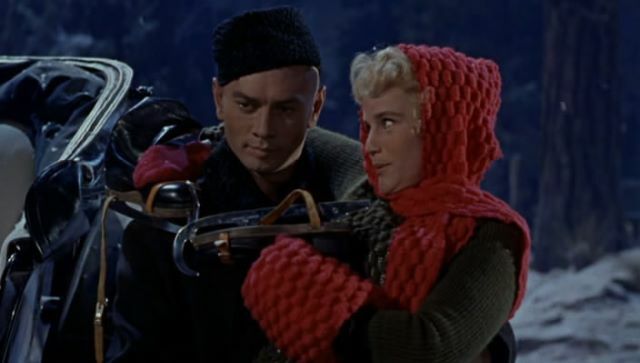 The series began on Friday, June 1 with Richard Brook’s 1958 Hollywood adaptation of The Brothers Karamazov, starring Yul Brynner, William Shatner, Lee J. Cobb, and Richard Basehart (of La Strada fame). By far the starriest night of the series, the film screened in the cinema of the Tribeca Grand Hotel, and opened with a lively introduction by Yul Brynner’s son, Rock. Though one might anticipate a kitschy bastardization of Dostoevsky, the film is, actually, enormously effective. Employing the aesthetics of Sirkian melodrama, the film disposes of Dostoevsky’s spiritual concerns and emphasizes the novel’s explosive plot. During the post-film audience discussion (a fascinating feature of each screening), the heavily Russian audience concluded that this Hollywood spectacle had truthfully captured the Russian soul. Later nights featured additional Karamazov adaptations, several versions of Gogol’s The Overcoat, and free adaptations of Bulgakov’s Master and Margarita. Several of these were premiere screenings in the US. A Soviet film of The Overcoat by Batalov featured brand new subtitles by Rebecca Pyatkevitch and was the film’s first public screening in the US. Incident in Judea by Paul Bryers, which adapted the Jerusalem story line of The Master and Margarita was also a US premiere. The final two premieres are surely the ones that were most exciting for cinephiles – Ivan Pyrev’s four-hour Soviet adaptation of Brothers Karamazov and Andrzej Wajda’s Pilatus und Andere, based loosely on the Jerusalem story of The Master and Margarita. Of the three Karamazov films shown (the final showing of the festival was the recent Czech film Karamazovi), Pyrev’s 1969 film was the only Russian language adaptation and the one that hewed closest to the lengthy novel. However, like the other films, it excised the famous Grand Inquisitor scene – a fact that was repeatedly puzzled over by the speakers who introduced each film. While the primary virtue of the Pyrev film was fidelity to the source material, Wajda used his already bizarre source material as more of a jumping off point than a strict guideline. The 1972 film was commissioned by a German television station to be broadcast on Good Friday. Shot in Munich, the film was made in much the same way as Wajda’s Danton, with German actors speaking their lines in German, Polish actors in Polish, and all characters dubbed into German for the final film. The film, which spends much of its running time focusing on Pilate’s ethical dilemma, has German actors as Romans and Polish actors as Judeans, all while taking place in the city that, for many, would become synonymous with the assignation of post-WWII moral culpability, creating clear historical parallels in much the same manner as Bulgakov’s double storylines. With a cast of Wajda regulars, including Daniel Olbrychski, Wojciech Pszoniak, and Jerzy Zelnik, the film takes the surreal elements that tend to appear in isolated moments in most Wajda films and runs with them. Though having Levy Mathvey, in jeans and white t-shirt, delivering a tortured monologue on a broken down car in a junk yard may distance the film from the novel in a superficial sense, the movie manages to capture the spirit of the book as well as, if not better than, a more straightforward adaptation. With an impressive group of academics introducing the films (including Columbia University’s own Catherine Nepomnyashchy and Rebecca Stanton) and an unexpected lineup of little-known films, the Russian Festival of Arts’ “Diverging Perspectives” series provided the New York film scene with a refreshing splash of academic rigor. The format and short length of the festival made it feel like a single event, a continuing conversation, giving the reader more context and opportunity for deeper exploration than is normally possible at film events. Sadly, attendance was minimal at every screening, though the there was a loyal core audience. With their “Diverging Perspectives” film series, Causa Artium has provided a sort of academic cinematic event that one rarely finds outside of the classroom. Hopefully, more events, with larger audiences, are to come. Written by: Shelley Farmer on June 20, 2012.